Home » Blogs » The BE Blog » 3.2 Billion Pounds of Progress! No, we’re not talking about a collective Weight Watchers group-loss goal or the number of plastic straws no longer used by quick serve restaurants, but insulation. According to the results of a new survey released by NAIMA, its member companies in the U.S. and Canada used 3.2 billion pounds of recycled materials in the production of residential, commercial, thermal, and acoustical insulation products in 2017. This achievement is an extension of the industry’s longstanding commitment to substantial use of recycled content in the production of fiberglass and mineral wool insulation products. As Americans grow increasingly aware of their environmental impact, manufacturers and builders are paying attention and taking steps to reduce their footprint and help consumers do the same. In fact, according to the Shelton Group EcoPulse report, 65 percent of Americans say a company’s environmental reputation has a moderate to very strong impact on their decisions whether to buy products or not. And while there are many measures of environmental impact, the use of recycled content is unquestionably one demonstration of a manufacturer’s commitment to conservation and sustainability. According to the annual survey, NAIMA’s U.S. members used more than 2.2 billion pounds of recycled glass in the production of fiberglass insulation while its Canadian members used 346 million pounds. Also, U.S. and Canadian manufacturers used more than 675 pounds of recycled blast furnace slag in the production of thermal and acoustical insulation. This healthy and vibrant collection and use of glass cullet is under threat. Waste handlers often request local governments to remove glass from the recycling stream. They justify such a measure because glass is not as profitable for them; this seems shortsighted given the environmental benefits associated with recycling. They also suggest that there is not a market for recycled glass. NAIMA’s recycling survey neatly refutes any such claim. 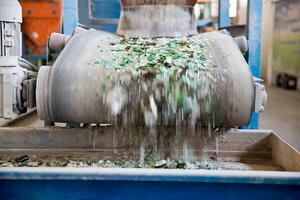 In fact, fiberglass insulation manufacturers are the second largest user of recycled glass in North America. In some jurisdictions, fiberglass is the largest user of glass cullet. The Glass Packaging Institute (GPI) says recycling glass provides unmatched production efficiencies and significant environmental benefits including saving on raw materials. GPI notes that the container and fiberglass industries collectively purchase 3.2 million tons of recycled glass annually, which is remelted and repurposed for use in the production of new containers and fiberglass products. Since the industry’s recycling program began in 1992, NAIMA members have diverted an estimated 58.2 billion pounds of recycled materials from the waste stream. For more on this and other great blog posts, visit The Insulation Institute's website.